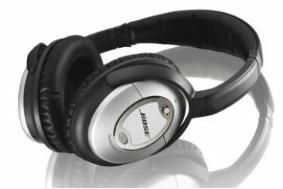 Bose introduces new mobile headsets and noise-cancelling cans | What Hi-Fi? Bose's Mobile in-ear headset will retail for £119 and is compatible with 'most music-enabled mobile phones' including the iPhone, and comes complete with a set of 2.5mm adapters for connecting to mobiles. Three different-sized silicone ear tips are provided, while the company's proprietary TriPort technology is present and correct. They will be joined by a pair of on-ear 'phones from £149. Both are due on sale this September. The QuietComfort 15 headphones claim "more attenuation in louder environments and across a wider range of frequencies – without compromising the audio quality". Powered by a single AAA battery, the QuietComfort 15 will retail for £299. Available in silver (pictured above) they will be released on September 28th. See the Bose website for more information.